There has been discussion about possible epithelial and or hemidesmosomal attachment to titanium abutments as a potential barrier to prevent the ingress of biofilm and bacteria down the periimplant pocket thereby resisting periimplant mucositis. A wide range of implant surfaces and treatments exist. 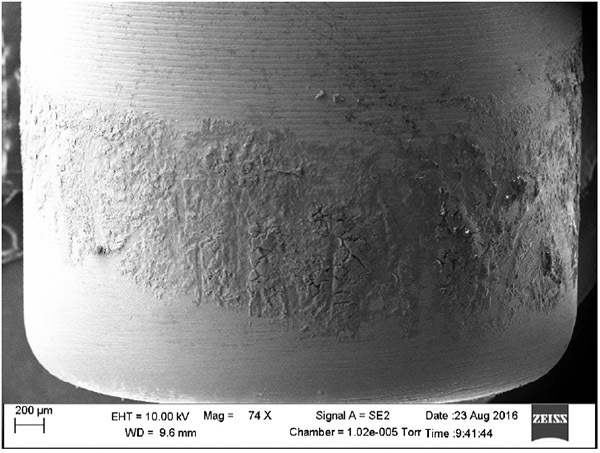 It was the aim of this study to use SEM to investigate biofilm, plaque formation and possible epithelial attachment to implant healing abutments having different surface characteristics and placed in patients for 8 weeks following implantation. A range of titanium implant healing abutments of diameter 4.3 and length 5mm were prepared with different surfaces; smooth machined (SM), blasted (BL), titanium microgrooves (MG), anodised titanium (AT), and anodised microgrooved (AM). These were attached to dental implants placed as a single stage in edentulous sites where the gingival incision was closed around the healing abutment and sutured. Sites were left undisturbed for 8 weeks. Thereafter healing abutments were removed, stored in formalin and fixed prior to sputter coating and SEM analysis. Abutments were examined in an SEM at varying magnifications. SEM analysis of the different dental abutment surfaces revealed a wide diversity of interfaces. All surfaces demonstrated clear and continuous biofilm formation supra- and sub gingivally. This appeared as a thin, uniform layer of proteins. There was widespread bacterial colonisation and plaque formation supragingivally and subgingival penetration especially on the SM and AT surfaces. Less colonisation was evident on BL surfaces. BL and MG surface samples did show some evidence of epithelial attachment. Anodising appeared to have no effect on biofilm or plaque formation. This was designed as a pilot study to gain preliminary information to ascertain the ability of ginigival epithelium to gain a direct soft tissue attachment to titanium surfaces.It does appear that surface modification may have an effect on altering the penetration of bacteria and colonisation subgingivally on healing abutment surfaces and therefore potentially on definitive abutments. Roughening the surface by blasting seems to be most effective although micro-grooves may have an impact.Further investigation with soft tissue biopsy and histology is warranted. Healing abutment with microgrooves showing supragingival plaque formation and subgingival biofilm.